Reducing the energy consumed by greenhouses has become a priority as the global use of greenhouses for food production has increased six-fold over the past 20 years to more than 9 million acres today—roughly twice the size of New Jersey, according to Loik. "It's big and getting bigger," he said. "Canada relies heavily on greenhouses for vegetable production, and their use is growing in China, too." 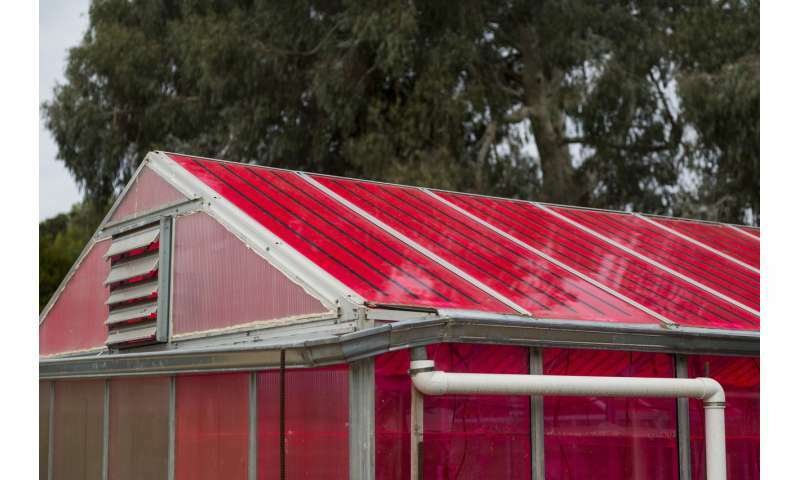 Plastic greenhouses are becoming popular for small-scale commercial farming, as well as for household food production, he added. Greenhouses use electricity to control temperature and power fans, lights, and other monitoring systems. "This technology has the potential to take greenhouses offline," said Loik, who specializes in climate change, plant physiology, water resources, and sustainable technologies. Cost per panel of WSPV technology is 65 cents per watt—about 40 percent less than the per-watt cost of traditional silicon-based photovoltaic cells. Wow! I was just thinking, this is exactly what I want. weed in the deep woods? This appears to be the opposite of efficient. Greenhouses are energy sinks not only because they need pumps and fans, but because they often use heating beyond what the sun can provide, to protect the plants from frost to extend the growing season. There might be enough light to grow plants, but if the temperature drops below zero in the night, all your plants will die. So solar power isn't the full answer. It lowers the energy demand, but doesn't make a fully self-sufficient greenhouse. How so? The plants grow just as well or better and the greenhouse can produce power.... Not sure what you are referring to in the slightest. Depends entirely on where you live and what crops you grow. In my country, The Netherlands, greenhouses are abundant in commercial farming, and they come in two types: 'hot' and 'cold', the former using additional heating (when required), the other not using any additional heating.